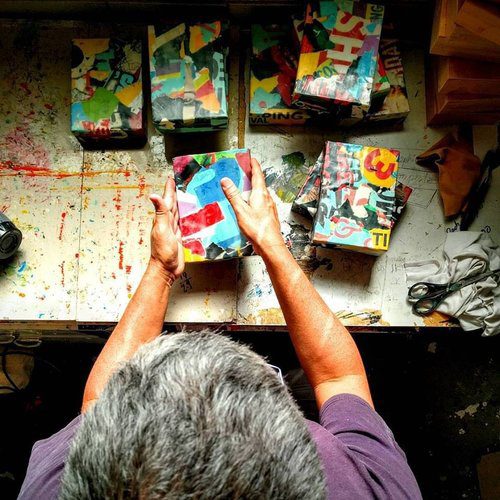 Artist Randal Arvilla will discuss the ancient technique of encaustic painting and describe his contemporary approach of using collage and carbon to create his sculptural encaustic works. Encaustic paintings are made by building-up multiple layers of hot wax, which is then cured. Randal will talk us through his process, demonstrate the materials he uses and describe the history of this technique, used by the ancient Romans and the American Abstract Expressionists. Feel free to join the conversation and enjoy a delicious cup of authentic, silky chai courtesy of The Chai Room. The Chai Room is generously supporting Collab by providing spicy chai made from hand-dried fresh ingredients. This is a free event, but please RSVP so we know how much chai to brew! Randal Arvilla is featured in Collab's current exhibition miniature (open until March 26).